The debate over who, in the media and in the IT scene, is responsible for Trump’s victory is just starting. I have been claiming for a long time that the issue is not an algorithmic one. The “algorithmic” candidate was Hillary Clinton: she embraced the big data targeting approach that helped Obama’s victory in 2012, and it seems that her campaign was coordinated by a data processing system called Ada. On the contrary, the secret of the Talking Combover’s victorious campaign is the exploitation of crowds of “click workers”, most of them located on the other side of the globe. If Hillary Clinton spent $ 450 millions, by comparison Trump spent less (about half of her budget), by under-paying subcontractors recruited on micro-work platforms. 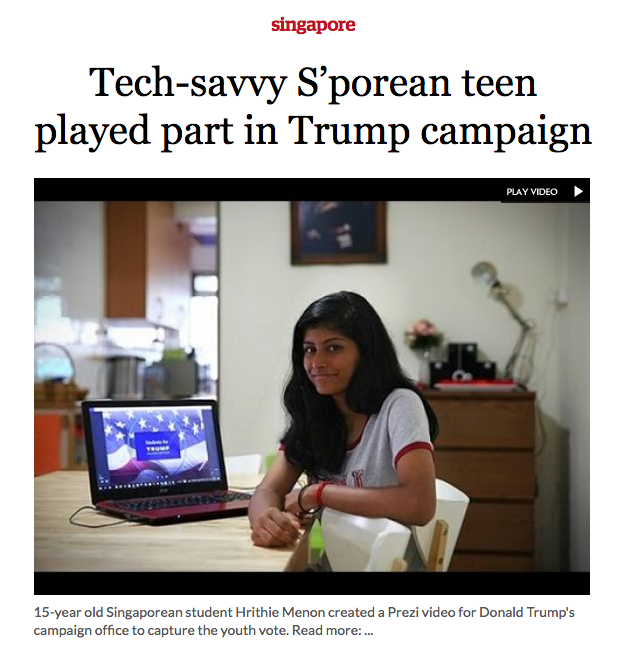 Maybe you have read the bitter-sweet news about a Singapore teenager who helped create a Prezi presentation for Trump. She was recruited on Fiverr, a platform where, for a few bucks, you can buy copywriters, graphic designers or coders. Those micro-workers live in more than 200 countries, but less well-paid tasks are mainly allocated to South-East Asian workers. This young Singaporean’s inspiring story must not distract from the real topic here: Trump customarily outsourced the production of campaign materials to underpaid digital pieceworkers recruited on digital labor platforms. The secret weapon of this racist, misogynistic candidate, well-known for shortchanging his employees was the exploitation of underage Asian crowdworkers. Who would have thought? Yet, some types of offshore micro-workers are less exemplary. You may have heard of the story of the “Macedonian spammers”. Turns out Trump received an unexpected help by working-class students of a little post-industrial town located in an ex-socialist country in Central Europe. They trained themselves to provide content designed to generate likes and posts promoting the worst hate messages and disinformation, in order to profit from a large click-market. Who is to blame ? Facebook’s business model? Who is to blame? The evil spammers or their instigators? According to a Business Insider’s analysis, the Trump campaign directly bought 60% of his Facebook followers. Those fans and most of his likes come from click farms in the Philippines, Malaysia, India, South Africa, Indonesia, Columbia… and Mexico. (Before you get all upset, you must know that this is pretty common in today’s Facebook. If you are not up to date on how Zuck’s platform limits the circulation of your content in order to dupe you into buying likes, this little video explains it. Please take 5 minutes to complete your education.). Of course, as I explained elsewhere, invisible digital labor is everybody’s burden. Facebook prides itself as being on free service. 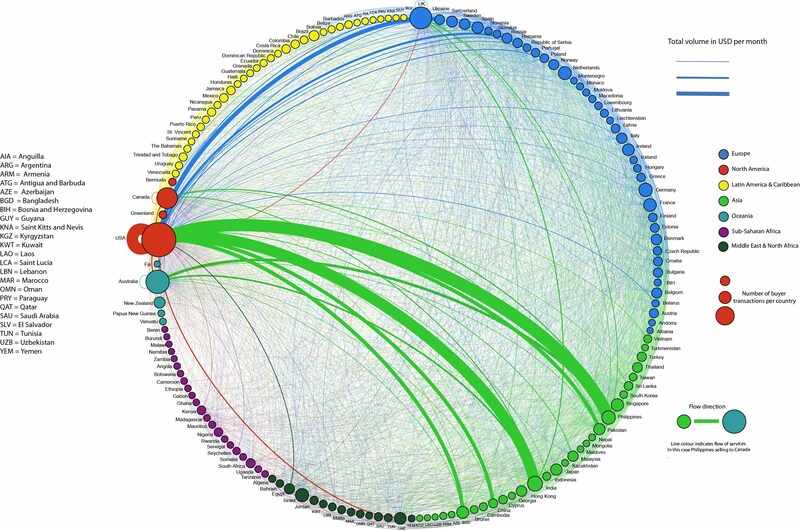 But it is also a huge marketplace for our personal data: contacts, preferences, network engagement etc. Today Facebook artificially limits the organic reach of content shared by its users. If for example you have 1000 “friends”, less than 10% will read your hilarious jokes or watch your kitten videos. Facebook officially claims that it is about filtering spam. But actually it has implemented a business model aimed at making users pay for a wider reach via sponsoring posts. This model is of less concern for individual users than for corporations and bad hair politicians whose marketing strategies are predicated on this social networking service: the latter are incentivized to have millions of users reading their propaganda, and they will pay to obtain more clicks. The fact is that this system is now based on “click-farms” that exploit workers living in developing or emerging countries. This huge market uncovers the delusion of voluntary participation in online social media, today constrained by the injunction to produce clicks within a productive system relying on an invisible workforce – invisible because literally offshored on the other side of the globe. A recent study by the Oxford Internet Institute reveals the existence of important work flows between the global South and the North: developing countries supply digital labor by performing micro-tasks, whose data and contents are demanded by Western countries. Nowadays, the biggest micro-task providers are based in the Philippines, Pakistan, India, Nepal, Bangladesh, Ukraine and Russia, and the biggest buyers are in the United States, Canada, Australia and the United Kingdom. Global North-South inequalities are thus reproduced. Especially if we consider that this is not a residual phenomenon but a real labor market: UpWork has 10 million users, Freelancers.com has 18 millions, etc. 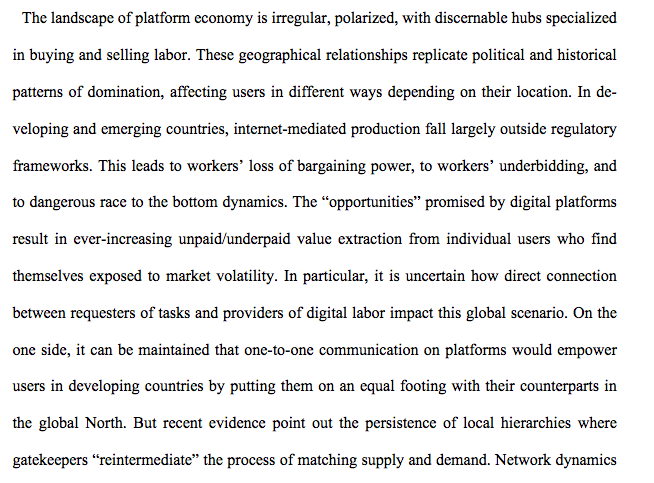 Digital labor supply from Asia, digital labor demand in Europe, Australia, and North America on a micro-work platform. To be clear: the structure of the current click economy and global digital labor maket helped Trump’s victory. Not algorithms. Nor fake news. The oppression of citizens in Western democracies, crushed for two decades under an ever shrinking political offer which has reached a far-right alignment of all parties across the parliamentary arch, for whom the only choice is fascism, but coming in different shades, goes hand in hand with the oppression of digital technology users, marginalized, forced into accepting only one centralized, normalized, censored and exploited mode of platform governance, opaque and asymmetrical, but downloadable through different apps. The following text was collaboratively translated by several of my Twitter followers using Framapad. The French original was inspired by Jean-Marie Le Ray and proofread by Jessica Chekroun. I thank them all for their time, passion, and curiosity.